The flavor perception occurs when a food or beverage enters the mouth and involves the combination of gustatory and olfactory stimuli, giving rise to descriptors including “fruity”, further details in orange, apple or strawberry flavors. Other senses, such as vision, audition and oral somatosensation, contribute to the flavor perception as well, which is defined as multisensory, cross modal interactions of tastes, odors, textures and auditory information. Multisensory is found in various animals and humans[1-5], for example, human’s flavor perception of the beverages and food can be influenced by their colors[6-9]. Spence and his colleagues used a same-different paradigm to test the people’s orange flavor discrimination in pairs of Smarties, a sugar-coated chocolate which is a common food product. They confirmed that people’s expectations concerning color-flavor associations modulated their flavor discrimination responses. Further, they found that flavor perception involves the combining of chemosensory information with both visual (color) information and cognitive, expectancy based (label) inputs. Meanwhile, label information was found to influence the consumer chocolate acceptability[11-12]. Besides the color and label information, Crisinel and Spence studied the cross modal associations between food and musical notes, pitch and eating sound, and confirmed that the auditory information interacts with the taste perception[8,13-17]. The auditory information acted as a conditioned cue, different from the indications of a food’s name which could raise a direct image of a certain food. The multisensory can vary with age and gender[18-27]. TAS1R receptors mediate sweet and umami tastes. Research on the behavioral, brain imaging and optogentic techniques showed that the brain structures including the insular cortex, the amygdale, the Anterior Cingulate (ACC) and medial Orbitofrontal Cortex (OFC) which has an important function in learning, memory and emotion, contribute to the multisensory and flavor representation in human and mouse[5,24-27]. Because the brain structures which contribute to cross modal interactions play an important role in learning and memory, it is not surprising that some researchers argued that the multisensory is an associative learning process rather than a sensory interaction. Shankar proposes that color-flavor interactions in flavor perception cannot be understood solely in terms of the principles of multisensory integration but also of higher-level cognitive factors, such as expectations. The previous studies widely addressed the multisensory between the flavor and the color of the food and the beverages in western people. However, the culture of food may influence the taste perception in different people. Therefore, in our current experiment, we tested the flavor and color cross modal interactions in young Chinese adults by using sweeties with 5 fruit flavors from Skittles. Skittles is not a Chinese traditional sweet, and is thus unfamiliar to most Chinese adults. They may have very few or no experience of eating Skittles during childhood since this product only came in China very recently. Therefore, the setting could exclude bias or preference in the experiments. Few studies used a verbal indication to test its disturb in flavor perception, or the role of memory in flavor-color interactions. 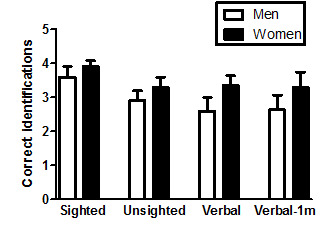 Thus, the aim of the study is to address: whether the visual information which can be seen by subjects themselves interacts with flavor perception under a sighted condition; whether incongruent verbal color labeling information which is indicated by the experimenter influences subject’s flavor perception under unsighted condition; whether learning and memory is involved in flavor perception and the gender’s effect. In total forty graduate and undergraduate students were recruited at Kunming institute of Zoology, CAS, in Kunming, Yunnan, China. Mean age was 25.9 ± 2.4 years, range 22 – 32 years. The sample was 50% male, 50% female. Exclusion criteria included a history of an allergy, bias or adverse reaction to sugar, fruit (orange, lemon, apple, strawberry and grape), a medical problem affecting appetite or eating, and having coffee, chocolate, spicy food or sour fruit in two hours before experiment. All participants had read and signed informed consent form before the experiment. The color matched to the flavor of each Skittles was written in the consent form. This work was approved by the Kunming institute of Zoology, Chinese Academy of Sciences and has been carried out in accordance with the Code of Ethics of the World Medical Association (Declaration of Helsinki). Skittles (Wm. Wrigley Jr. Company, China) were bought from Carrefour in Kunming and used as a vehicle for flavor delivery. Skittles provide five kinds of standardized and reproducible tastes and have five flavors with different colors of the corresponding fruits: orange flavor (orange color), lemon flavor (yellow color), apple flavor (green color), strawberry flavor (red color), grape flavor (purple color) according to the notation on the Skittles package. 5% male and 40% female participants had experience of tasting Skittles in their life, while others had no experience before. The complete testing procedure was conducted between 9:00 am. - 11:20 pm and 2:00 am. - 5:30 pm. All subjects were nonsmokers and were tested individually. After having read and signed the consent form, subjects were asked to participate in the tasting experiments which had four sessions. In each session, subjects were asked to taste five small pieces of Skittles with or without seeing their colors. The order of five kinds of Skittles was randomly assigned to each subject. The interval between each tasting trial was more than 5 minutes. During each ITI, subjects were asked to rinse their mouth out thoroughly with water. Sessions 1 - 3 were conducted within 1 - 2 days. Session 4 was conducted one month after Sessions 1 - 3. The participants were asked to randomly taste five kinds of fruit flavor Skittles one by one, and report the flavor of each Skittles or uncertainty. If they reported wrongly, they would be told the correct flavor according to the packaging information of the Skittles. They could see the color of the candy so they could learn to associate the color with a certain flavor. The participants were asked to taste five Skittles and report each flavor with their eyes close, for the purpose of elimination of the visual input. The subjects were under unsighted condition. Before each tasting, subjects were orally indicated one of five colors of Skittles they would take. The verbal color labeling information was mostly misleading (97%), while a small proportion of the notice (6/200) correctly matched the colors with corresponding candy. In order to test if the participants’ memory contributed to performance, one month after Sessions 1 - 3, 11 of the male participants and 10 of the female participants who had taken Sessions 1 - 3 were available return. They were asked to repeat Session 3. The number of correct identifications each participant made in each session was recorded individually. All results were expressed as mean ± S.E.M. (standard error of mean). The statistical package SPSS 12.0 (SPSS Inc., Chicago, IL, USA) was used for data analysis. Differences between Sessions 1 - 4 and genders were assessed with an ANOVA and Tukey’s multiple comparison test was used to analyze the difference of groups, while a two-way ANOVA with repeated measures was used to analyze the difference between Sessions 1 - 3. The number of correct identifications among the different flavors for the subject was expressed as mean and was analyzed with the Chi-square (x²) test. Differences were considered significant when P ≤ 0.05. 1. One-way ANOVA analysis showed a significant difference between groups (F (3, 140) = 2.77, P = 0.044). The repetitive measure showed that proportion of correct responses given by participants significantly decreased in Session 2 (unsighted) (P < 0.05) and Session 3 (verbal) (P < 0.01) compared with Session 1 (sighted) (within effect of Sessions 1 - 3: F(2,119) = 5.43, P = 0.0062), as shown in Figure 1. 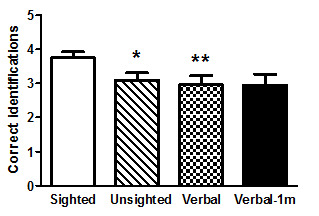 No significant difference was found between the sighted session and Session 4 (verbal-1month) according to one-way ANOVA analysis (Figure 1). The proportion of correct identifications was lower in the unsighted and verbal session than in the sighted session respectively. *P < 0.05, **P < 0.01 vs the performance in the sighted session. 2. There were no significant differences between men and women in all sessions. However, the women had an overall tendency to distinguish the flavors better than the men (Figure 2). Figure 2: Flavor discrimination in man and woman. There were no significant differences between men and women in all sessions. 3. 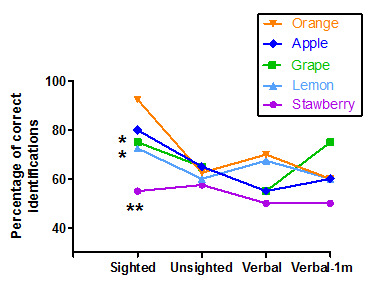 When five kinds of Skittles were analyzed using a chi-square test, a significant difference among five kinds of Skittles was found in sighted session (X² = 15.73, P = 0.003), but not in the unsighted, verbal and verbal-1 month sessions (Figure 3). In the sighted session, differences between the orange flavor Skittles and the strawberry (X² = 14.53, P < 0.001), grape (X² = 4.50, P = 0.034) and lemon (X² = 5.54, P = 0.019) ones were found (Figure 3). Figure 3: Percentage of correct identifications among five flavors in the four sessions. Subjects showed a difference in flavor discrimination between orange and grape flavors, lemon and strawberry flavors. *P < 0.05, **P < 0.01 vs the performance of orange flavor. Our results show that visual information improved the correct identifications in the flavor perception, while the incongruent verbal color labeling information had no effect on the unsighted discrimination of flavors. Associative learning may have contributed to this process. We chose Skittles as stimulus to test the flavor perception because this kind of sweets has five bright colors and different colors match with different flavors, which are easy to be discriminated; it is also unfamiliar to most Chinese subjects. In the sighted condition (Session 1), since the participants had read which colors match with which fruit flavors respectively before the trials, they could learn to associate the colors with corresponding flavors. However, in the unsighted session, they could not see the colors of the candy, and the proportion of correct identifications was therefore decreased significantly, suggesting that color, as visual information, contributes to taste perception, a conclusion consistent with other studies[6-9]. A meta-analysis on the neural correlates of processing visual food cues addressed that food selection is primarily guided by the visual system, bilateral posterior fusiform gyrus, the left lateral Orbitofrontal Cortex (OFC) and the left middle insula, which are activated in response to viewing food pictures. Gibson argued that animals’ primary purpose of perception is to seek objects in the environment, particularly those that are biologically important to survival, specially foods, while our senses functionally united when anatomically separated. Therefore, we rely on our vision mostly while seeking for food and evaluate the visual and taste multisensory associations among the chemosensory stimuli. However, what is the role of imaging created without seeing in the cross modal interactions? If subjects are indicated the name of the food, they need to build a representations of the food in their mind: in the verbal session, when subjects were indicated the colors of the sweets by the experimenter, they might first evoke an image of the food according to the indications and then estimate if this image matches the actual flavor generated from the mouth. Interestingly, they failed to use the verbal color labels to judge their identification. Meanwhile, the incongruent verbal color labels failed to disturb their identification as well: the score was similar as that of the unsighted condition. The participants in the current experiment were all postgraduate students aged 22 - 32 years old, who probably were comparatively reasonable and were not easily disturbed by information which could not be seen directly. The image made by incongruent verbal color labels could not guide a subject to make a wrong decision. Thus, the first taste always comes with eyes. In addition, it also suggested that associate memory acquired in the session 1 contributed to the subject’s decision under unsighted and verbal color label conditions. Studies using brain imaging techniques showed that tastes can be imagined and brain regions activated for taste imagination are consistent with regions previously described for actual taste perception. However, imagination had little effect on flavor perception in an unsighted condition in our experiment. Depending on children’s ages, their taste perception is more easily influenced by information provided, probably due to the extent of their brain development which is required for the high cognition. This raises an interest in using an incongruent verbal labeling paradigm to test flavor perception of children at different ages in the future, with the expectation that autism children may have a different result. On the other hand, the experiences acquired by the participants from the sighted session might be used to avoid a wrong decision under the incongruent verbal color labels. This acquired memory lasted for at least 1 month in our experiment since the participants showed no difference from the session 1. It suggests that flavor perception which is based on an associate learning might have a long-lasting effect of prior experience. This result was in line with previous studies which argue that the color-flavor interactions in taste perception are based on association learning and memory, and is also involved in high-level cognition[28,29]. Recently, a research tested customers to evaluate taste of chocolate according to sound-taste correspondences and found that the customers had a significantly better tasting experience when the sounds were presented as part of the food’s identity, and they were also willing to pay much more for the experience. It suggests that previous experience, which plays an important role in flavor perception, is also a memory imprinted in the brain and tongue. Although there was no significant difference between men and women in all sessions, the women had a tendency to discriminate the flavors better than the men under the unsighted and verbal conditions. The reason might be that the women (40%) had more experience of tasting Skittles than the men (5%). Women are generally more disgust-sensitive and morally condemning than men in 6-N-Propylthiouracil (PROP) tasting test. In another study, female performed better than men in memory task, but they were no better in discriminating the products on both the hedonic and the perceptual dimensions. In addition, not all sensory aspects, which could be discriminated in perception and in liking, were equally well remembered. It was partly in line with our results which showed that women have a tendency to memorize the flavor perception better than men in the unsighted and verbal situations but showed an overall similar hedonic liking as men. Regarding to the multisensory in 5 flavors, when the colors were seen by subjects, in general the orange flavor was the easiest to be discriminated among all flavors. However, when subjects were blind to the colors of the sweets, all five flavors equally failed to be discriminated, suggesting that orange-flavor-associated learning is most influenced by the color. While strawberry flavor was the least discriminated flavor, the reason might be partly that the red color also represents other fruits, for example, apple. People’s prior beliefs of a certain color representing certain flavor influenced flavor discrimination. The orange color was more distinctive in suggesting orange flavor than red color was strawberry flavor. This result is consistent with the study from Levitan, in which even though orange-colored Smarties have a distinctive flavor, they could not be distinguished in a blindfolded condition. The results from the current study confirmed a number of previously proved findings concerning crossmodal interactions of color and flavor perception, but here for the first time, found that incongruent verbal color labels failed to influence the multisensory which might involve associate memory. This work was supported by the National Science Foundation of China (NSFC 31771194, 31571109, Chinese-Finnish joint project 813111172) and Yunnan Key Program of Science and Technology (2017FA042). There is no conflict of interest with the sponsors. 1. Auvray, M., Spence, C. The multisensory perception of flavor. (2008) Conscious Cogn 17(3): 1016-1031. 2. Roper, T.J., Marples, N.M. Odour and colour as cues for taste-avoidance learning in domestic chicks. (1997) Anim Behav 53(6): 1241-1250. 3. Spence, C. Multisensory flavor perception. (2015) Cell 161(1): 24-35. 4. Van, B.M., Bult, H., Renken, R., et al. Effects of visual priming on taste-odor interaction. (2011) PLoS One 6(9): e23857. 5. Wallace, M.T. Multisensory Perception: The Building of Flavor Representations. (2015) Curr Biol 25(20): R986-988. 6. Levitan, C.A., Zampini, M., Li, R., Spence, C. Assessing the role of color cues and people's beliefs about color-flavor associations on the discrimination of the flavor of sugar-coated chocolates. (2008) Chem Senses 33(5): 415-423. 7. Prescott, J. Multimodal Chemosensory Interactions and Perception of Flavor. (2012) Boca Raton (FL): CRC Press/Taylor & Francis. 8. Zampini, M., Spence, C. Assessing the Role of Visual and Auditory Cues in Multisensory Perception of Flavor. (2012) Boca Raton (FL): CRC Press/Taylor & Francis 739-758. 9. Zellner, D.A., Durlach, P. Effect of color on expected and experienced refreshment, intensity, and liking of beverages. (2003) Am J Psychol 116(4): 633-647. 10. Shankar, M. U., Levitan, C. A., Prescott, J., et al. The influence of color and label information on flavor perception. (2009) Chemosensory Perception 2(2): 53-58. 11. Kim, M.K., Lopetcharat, K., Drake, M.A. Influence of packaging information on consumer liking of chocolate milk. (2013) J Dairy Sci 96(8): 4843-4856. 12. Torres-Moreno, M., Tarrega, A., Torrescasana, E., et al. Influence of label information on dark chocolate acceptability. (2012) Appetite 58(2): 665-671. 13. Crisinel, A.S., Spence, C. Implicit association between basic tastes and pitch. (2009) Neurosci Lett 464(1): 39-42. 14. Crisinel, A.S., Spence, C. As bitter as a trombone: synesthetic correspondences in nonsynesthetes between tastes/flavors and musical notes. (2010) Atten Percept Psychophys 72(7): 1994-2002. 15. Crisinel, A.S., Spence, C. A sweet sound? Food names reveal implicit associations between taste and pitch. (2010a) Perception 39(3): 417-425. 16. Crisinel, A.S., Spence, C. Crossmodal associations between flavoured milk solutions and musical notes. (2011) Acta Psychol (Amst) 138(1): 155-161. 17. Crisinel, A.S., Spence, C. A fruity note: crossmodal associations between odors and musical notes. (2012) Chem Senses 37(2): 151-158. 18. Bartoshuk, L.M., Rifkin, B., Marks, L.E., et al. Taste and aging. (1986) J Gerontol 41(1): 51-57. 19. Chan, M.M., Kane-Martinelli, C. The effect of color on perceived flavor intensity and acceptance of foods by young adults and elderly adults. (1997) J Am Diet Assoc 97(6): 657-659. 20. Clydesdale, F.M. Changes in color and flavor and their effect on sensory perception in the elderly. (1994) Nutr Rev 52(8): S19-20. 21. Kinnamon, S.C., Margolskee, R.F. Mechanisms of taste transduction. (1996) Curr Opin Neurobiol 6(4): 506-513. 22. Oram, N., Laing, D.G., Hutchinson, I., et al. The influence of flavor and color on drink identification by children and adults. (1995) Dev Psychobiol 28(4): 239-246. 23. Kim, U.K., Breslin, P.A., Reed, D., et al. Genetics of human taste perception. (2004) J Dent Res 83(6): 448-453. 24. Miranda, M.I. Taste and odor recognition memory: the emotional flavor of life. (2012) Rev Neurosci 23(5-6): 481-499. 25. Ohla, K., Toepel, U., le Coutre, J., et al. Visual-gustatory interaction: orbitofrontal and insular cortices mediate the effect of high-calorie visual food cues on taste pleasantness. (2012) PLoS One 7(3): e32434. 26. Small, D.M., Green, B.G. A Proposed Model of a Flavor Modality. (2012) Boca Raton (FL): CRC Press/Taylor & Francis. 27. Sperdin, H.F., Cappe, C., Murray, M.M. The behavioral relevance of multisensory neural response interactions. (2010) Front Neurosci 4: 9. 28. Connolly, K. Multisensory perception as an associative learning process. (2014) Front Psychol 5:1095. 29. Shankar, M.U., Levitan, C.A., Spence, C. Grape expectations: the role of cognitive influences in color-flavor interactions. (2010) Conscious Cogn 19(1): 380-390. 30. Van der Laan, L.N., de Ridder, D.T., Viergever, M.A., et al. The first taste is always with the eyes: a meta-analysis on the neural correlates of processing visual food cues. (2011) Neuroimage 55(1): 296-303. 31. Levy, L.M., Henkin, R.I., Lin, C.S. Taste memory induces brain activation as revealed by functional MRI. (1999) J Comput Assist Tomogr 23(4): 499-505. 32. Lumeng, J.C., Cardinal, T.M. Providing information about a flavor to preschoolers: effects on liking and memory for having tasted it. (2007) Chem Senses 32(6): 505-513. 33. Reinoso C.F., Van Ee, R., Rychtarikova, M., et al. Using sound-taste correspondences to enhance the subjective value of tasting experiences. (2015) Front Psychol 6: 1309. 34. Herz, R.S. Verbal priming and taste sensitivity make moral transgressions gross. (2014) Behav Neurosci 128(1): 20-28. 35. Laureati, M., Morin-Audebrand, L., Pagliarini, E., Sulmont, et al. Food memory and its relation with age and liking: an incidental learning experiment with children, young and elderly people. (2008) Appetite 51(2): 273-282.